First things first: you’re welcome. Don’t worry about the why just yet. But know that you’re about to be stricken by an inexplicable urge to thank someone. Anyone. Allow us to introduce you to the Southern Comfort Burger, a not-so-artfully-named meat disk fully redeemed by its flagrant and glorious overutilization of bacon mac and cheese and booze-spiked BBQ sauce, available now at the Nook in Midtown. 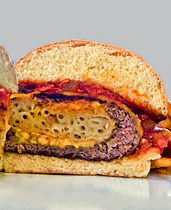 A massive patty stuffed with a ball of fried bacon mac and cheese with a hint of Tabasco (yes, it’s on the inside), topped with more cheese, then laced with a homemade spicy BBQ sauce infused with Southern Comfort and peach, and topped with crumbled Golden Flake Southern Heat potato chips. And welcome back. It’s the kind of gastronomical wizardry and beefy innovation that makes you proud of the human race. It also happens to be the perfect vessel by which to prep your mind, body and soul for the months-long eating competition otherwise known as the holidays. We’ll try to find you a new gym or something later.